It doesn’t matter if you are buying or selling a home. When you’re completing a major real estate transaction, you often rely on the information and advice your professional real estate agent has to offer. From setting a price for the sale of your home or determining the right price to offer on a new home—to making negotiations to get to the closing table, your agent is an incredible resource. 1. What is an average commission fee? It is widely known that real estate professionals work for a commission. Buyers and sellers do not pay their agents out of their own pockets. Instead, agent fees are brokered into the entire transaction. While that might be a set fact, there is no set commission for agents. Real estate agencies have their own fees and structures. So, your real estate agent might be able to explain how his or her agency works, but they will not be able to compare their structure to other agencies. 2. What are the neighborhood and schools like here? Your real estate agent should be able to share information about area restaurants, transportation, and other amenities, but when it comes to the schools or demographics of a neighborhood, your real estate agent might not be able to provide the information you’re looking for. Because of Fair Housing regulations, your agent can point you to resources that might help you learn about a certain area, but they are not able to offer their own opinions on things like neighborhoods, schools or safety. 3. Which lender do I have to use? Some buyers fear the real estate process because of the financial aspects. A common question for many real estate agents is, “Which lender do I have to use to buy a home?” It’s true that many agents have a connected network of service professionals that they can refer to buyers. However, the truth is that no law requires a buyer to work with any particular lender. You can take your agent’s advice, but you are absolutely free to choose the lender that is best for you and your financial situation. 4. Which inspector do I have to use? Like the way a real estate professional might know of a lending institution that has worked well for previous clients, your agent might be able to suggest a home inspector that they have worked with in the past. Also, like the way you are free to choose your own lender, you can select your home inspector too. Word-of-mouth advice is great, but the decision is ultimately up to you. You are welcome to use the inspector your agent suggests, or you can find a reputable inspector on your own. 5. Is this home a good investment? This is one question everyone wishes they could answer. However, it is simply impossible to predict the future! When you buy a home, you might plan to live there for 20–30 years—or you might intend to sell it in a short amount of time in the hopes of making a profit. While your real estate agent can show you a home’s sales history and even compare it to similar homes nearby, an agent cannot predict how market conditions may change over time. 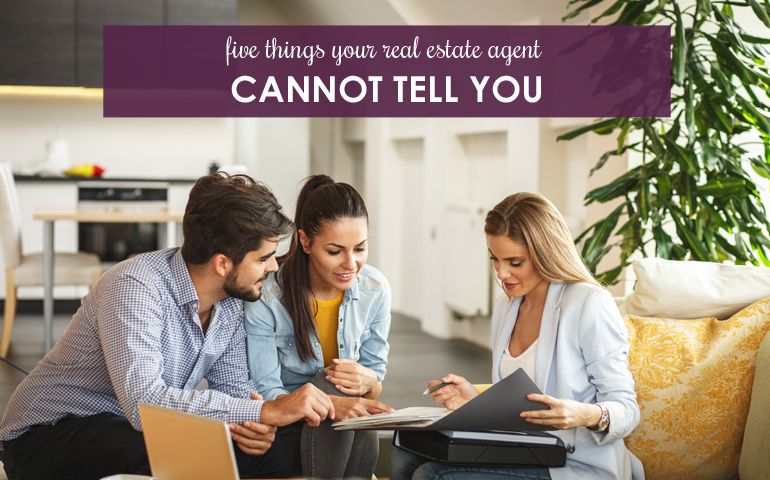 Though these are five things your real estate agent cannot tell you, there is countless information they can share during the home buying and selling process. Find an agent you trust and rely on their expertise to help you reach your buying and selling goals.